As 50% of Dalton Koss HQ (DKHQ), I spend much of my time speaking to young people who want to work in the music industry. Most are aware that there are no regular, standard jobs in the music industry. There probably aren’t even any long term careers. More likely it’s a lifestyle of freelancing and projects. As such, it’s highly unlikely that there will ever be an advertisement in the jobs section of a mainstream newspaper for a high paid, permanent job in the music industry. But do creatives actually want bog standard ‘jobs’? I think not. I’ve always maintained that clever, creative and entrepreneurial people will always be in high demand, this is probably more so in the music and creative industries then any other sector. When I mention the word entrepreneur people’s eyes begin to glaze over as they think of Richard Branson, Mark Zuckerberg or Steve Jobs. I once worked at a creative arts educational institution with a remit of educating the new wave of performers, audio professionals and music industry free thinkers. I embraced this remit and provided creative solutions through, what I thought, was inspirational leadership. My job was to provide leadership, facilitate creative solutions while enabling and building a knowledge economy for the next wave of creative entrepreneurs, the radical free thinkers that the music industry desperately needs. I saw opportunity and value in students playing guitars and singing in the reception area, watching and editing audio/film on their smartphones and interacting via social media. I actively encouraged students to be creative at every opportunity regardless of physical location. The Dean of this institution stopped staff and students interacting and being creative in these unconventional learning spaces, as he believed learning could only effectively take place in a classroom. Apparently the ‘correct’ way to teach creative entrepreneurship is the schooling of students in Boston Consulting Group (BCG) quadrant charts, etc. He even went as far as buying a job-lot of white boards and marker pens with the direct instruction to do “the traditional stuff”. Another can of beige paint added to an already vast ocean of beige. I was out of that place as quick as you could say, “asymmetrical repurposed collaborative content with frictionless deliverables ”. Sitting around and waiting for things to happen is not a good strategy in the creative arts and music business. In Malcolm Gladwell’s 2008 book Outliners: The Story Of Success he repeatedly mentions the “10,000-Hour Rule“, claiming that the key to success in any field is, to a large extent, a matter of practicing a specific task for a total of around 10,000 hours. Interestingly Malcom Gladwell’s theory can also be applied to professional sport and in particular cycle racing. Going back to music, lets look at the 1960’s popular Liverpool beat combo The Beatles. Prior to leaving for Hamburg, The Beatles were arguably a second rate cover band who were not very musically proficient. Fast forward to Hamburg and as John Lennon noted “we had to play for eight hours solid a day, every day”, this was the inspiration for the single Eight Days A Week. This postwar model of an artist’s progress was a type of professional development. Artists didn’t burst from obscurity to celebrity with a single astonishing piece of work. They slowly climbed the ranks. They accumulated credentials and amassed a creditable résumé. Artists learnt their trade and craft, that’s how The Beatles became really, really good at what they did. Creativity – generating new ideas, evaluating them effectively and critically, and taking action to turn them into new products and/or services. Collaboration – connecting and working with partners, clients, stakeholders and other significant players in your network, which will probably be scattered across the globe and contain more ‘virtual’ relationships than face-to-face ones. Entrepreneurship – identifying opportunities in the marketplace and using business skills to monetize ideas into products and/or services. These three core facets are best taught in a real world simulator or even better in the actual real world. They do not lend themselves to the strict beige classroom environment, flip carts and marker pens. Ask any young band out on the road, playing gigs, selling shirts, communicating with their audience via social media and sharing their music via on-line platforms exactly what it is that they are doing and I guess they won’t reply with “being entrepreneurs”. In actual fact that’s exactly what they are. On my visits to various educational institutions around the world I regularly give master classes and lectures on careers in the music and creative industries. Over the years I’ve earned a living as a live sound engineer, tour manager, studio engineer, record producer, artist manager, A&R consultant, rehearsal studio owner and record label executive. Discussions with early career professionals nearly always focus on how I got started on my 34-year career in the music industry. What was my personal journey? Space, place and time are extremely complex mediums and trying to make any sense of these independently, let alone in combination, can be infuriatingly difficult. As I stare at the picture below of a much younger version of myself, it is difficult to unravel the truth from the myth. If memory serves me correctly, this picture was taken in 1983 when I was just 20 years old. I had left school in the heat wave summer of 1979 and went straight to work in the local music scene. Initially, this was with a rag-tag and bobtail collection of ex-school mates and bands where my brother, Nick, played drums. Two 1×15″ scoop bins, loaded with HH speakers. Two 2×12″ mid cabinets, loaded with Celestion speakers. Two 1″ RCF compression drivers loaded onto some fibreglass flares. 18meters of 12 way multicore with three return lines (left, right & holdback). Foldback amp was a McGregor 120 watt power amp with 6 band graphic EQ. Main PA was powered via a Traynor x3000 bi-amp amplifier. This was supposed to give two channels of 300 watts for the lows and two channels of 150 watts for the mids/highs. Originally the system was powered by two HiFi amplifiers in a home built, fan cooled plywood box, the ‘Rabbit hutch’. This died on the second or third gig, so I invested the first few hire fees into the purchase of the Trainer amplifier; money well spent. Back in the early 1980’s, music industry/audio university and college courses did not exist, so entry into a career in these fields took a more ad-hoc and self-driven approach. Originally I played rhythm/2nd guitar in long forgotten ska-punk outfit before getting ‘promoted’ (due to musical differences) to roadie. This opportunity in disguise led me into a still continuing 34-year career in the music industry. At the start of this journey there was no business plan of what I was going to do or what the various career options were going to be, I just did it. Very quickly it became clear that I had a particular interest in the audio side of playing live. All of my early work took place in the city in which I was born, Hull located in East Yorkshire within the UK’s northeast. In the 1980’s, Hull had the most fantastic underground music scene, partly due to the high unemployment rate and its geographical isolation. Prior to this period, Hull’s only claim to rock ‘n’ roll fame was that David Bowies’ backing band The Spiders From Mars featuring the world’s 64th greatest ever guitarist (Rolling Stone Magazine 2003) the late great Mick Ronson, came from Hull. This was set to change in the early 1980’s with the onset of the ‘Humber Sound’ and a flurry of band formations. Bands like the Akrylyk Vyktymz, Red Guitars, International Rescue, House Martins, Pink Noise, Everything But The Girl, King Maker and Les Zeiga Fleurs, all of which I worked with, made some type of impression on the UK music scene. A reoccurring problem that I faced during this period was the PA system, or rather the lack of one. Either the system was of dubious quality and/or were ridiculously expensive to hire. That was because there was no local PA company based in Hull. All PA systems had to be brought into the city increasing costs for the live music scene and a logistical nightmare. Adversity often drives people into unconventional behaviour patterns and this is probably what happened here. Unable to source a good quality but reasonably priced PA systems for the bands that I was mixing, I took the massive jump to build my own system. The logic here being that I would learn about PA systems from the ground up, I’d get exactly what I wanted and upon completion I could hire it out allowing me to build more equipment. In late spring 1983, I had saved enough money, though not enough, and I went in search of a bank loan. Luckily a local bank decided that I was one of Mrs. Thatcher’s new breed of entrepreneurs. At the time I didn’t think so, but in retrospect maybe I was? Armed with an £800 ($1,540 AUS) bank loan, to be paid back over the next three years, and lots of magazine articles and books on PA cabinets, speakers and amplifiers, I set to work in my dad’s garage. A ‘Fab Lab’ long before they became trendy and ubiquitous. Building monitor wedge speakers in my Dad’s ‘Fab Lab’. Each comprised of 1×12″ Celestion woofer and a 2″x5″ 200 watt piezo tweeter horn. I arranged for a local timber company to deliver numerous sheets of plywood, lots of lengths of 2”x1”, wood glue and several large boxes of No. 6 screws. The only power tool my Dad owned was a very old, knackered Black & Decker electric drill, which I managed to spectacularly break in a hail of orange sparks after a few days. All the cutting of timber, screwing, filling, sanding and painting was done by hand; only the first few days of drilling were electric. After a few days of 10 hours shifts my PA was complete as was my new company Blind Entertainments. So named because I was doing this entirely blind, metaphorically, and it was also fairly entertaining. Once I had built this PA a massive oversight came to the fore, how was I going to transport it? Maybe a flip chart and some marker pens would have helped me overcome this oversight? A PA system that couldn’t move from my Dad’s garage wasn’t going to generate much income. Luckily a very tired, ex-supermarket delivery Ford Transit van was sourced, re-sprayed plain white and I was in business. The PA fitted in the van perfectly, almost as if it had being designed for it (it hadn’t of course). 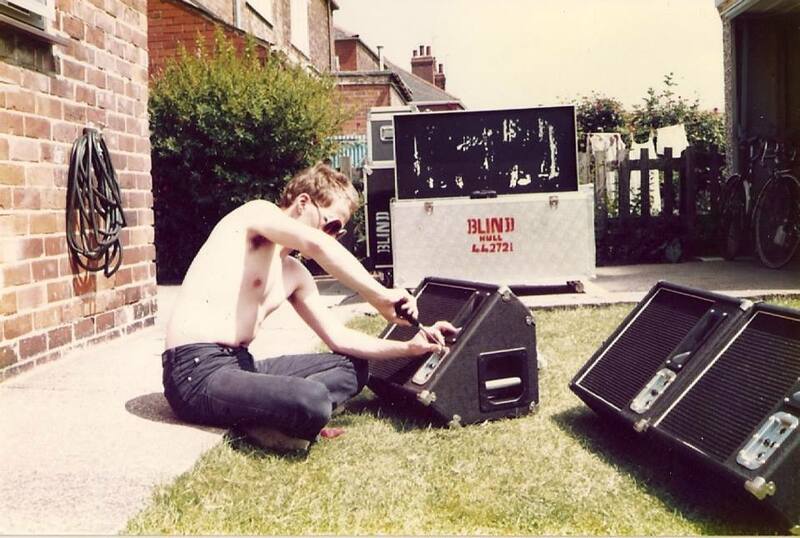 The gigs came thick and fast, not because the PA was particularly good, more that I was young and was very enthusiastic about the bands I worked with. I totally embraced the rock ‘n’ roll lifestyle, I put the hours in and it felt good. I also found that owning a van provided a sideline income e.g. I got to drive bands all over the UK and mix them, a sort of start to my live sound and tour managing career. 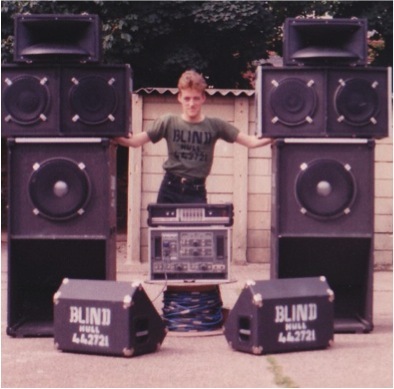 The PA system and Blind Entertainments grew in size and eventually led to the formation/evolution of my production company Total Concert Solutions (that’s a different story). It goes to show that a rag-tag, no experience and unconventional but enthusiastic school leaver can become a successful entrepreneur by doing what you love.